This thing looks like a monster Mike…. Amazing how many boxes/deluxe’s are coming out right now! They keep creeping up in price too. Yeah the Rush deluxe is 30 bucks on iTunes …I think I may buy the physical copy as I have a gift card to Sunrise….I pretty much want the Hammersmith show anyways…. I especially want the 5.1 mix. I know, there’s that new Rush one, bound to be a must-have. Impossible to actually keep up. Believe it or not I’m glad Rush is releasing A Farewell To Kings as its one of the only Rush albums I have never owned! Now is the time to pounce but I will just get the 3 CD set…Live show is the selling feature for me! Looks like a madcap scene and the Max machine. They’re just Max Webster, here to thin the thickness of your skin! I saw the Max Webster reunion at Lulu’s Dec 31 1995. Kim giving a shout out to Pye Dubois. Check. That New Year’s Eve show was the greatest concert I’ve ever attended in my life! No other New Year’s Eve party will ever come close to that! I have a bootleg video of that whole show. Absolutely beautiful stuff! Hey Tino! Thanks much for the comment! This looks like a pretty nice no thrills set. Definitely a shame they couldn’t include some sort of booklet given the efforts to remaster and package them up like that. Well, for the price point, I’m really not one to complain. I’m very satisfied and I’m about to start a third run through. Glad the know a guy who knew a guy story checked out after all! Uncle Meat never lies and his sources are always credible! Wow. Just… wow. This thing is glorious! Glad you got to hear it all! Well worth the measly dollars for 8 CDs of some of the best Canadian rock ever produced. This is a band I’ve always wanted to get more into. Might download a bit before committing to buying. I like the break down of the packaging. I’m always worried that the discs are only going to coming in cardboard sleeves instead of something that feels like a CD. Yeah packaging gets cheaper as record companies cut costs. The vinyl set is gorgeous but limited to 250 pieces I believe. I strongly recommend that you check out some Max Webster post-haste. I’ll send you something on FB. Thanks for the review, Mike. 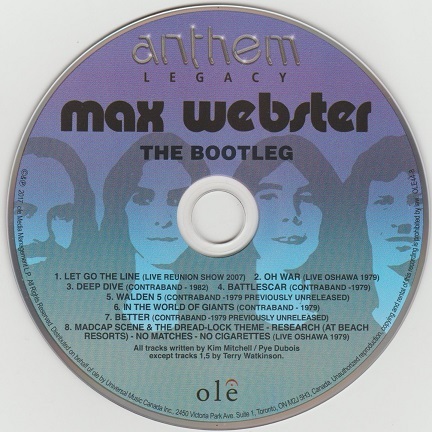 I’ve been a Max Webster fan based in the UK since I first heard A Million Vacations in 1979. I was hooked then and just as hooked today. 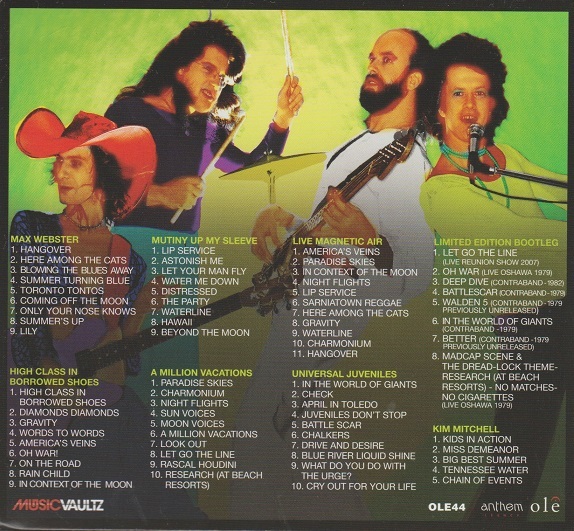 The Bootleg disc is a real treat having only ever heard Deep Dive on the Kim Mitchell live album. There are a couple of other excellent, fast-paced Kim songs which come from around that time (maybe later, I’m not sure) called Accidents of Passion and Watch and Be Set. They didn’t appear on any MW or KM albums but were both played live from 83/4 onwards. I only just saw the box set advertised and ordered the CD within seconds of seeing the ad. I have all the original vinyl which still sound great to these frazzled ears. P.S. If I have one gripe with the CD box (and it is a tiny gripe) is why did Anthem have to use the same disc label design on each of the eight discs?